When it comes to popular ice cream flavors, particularly in the USA, then Rocky Road has to be on the list. 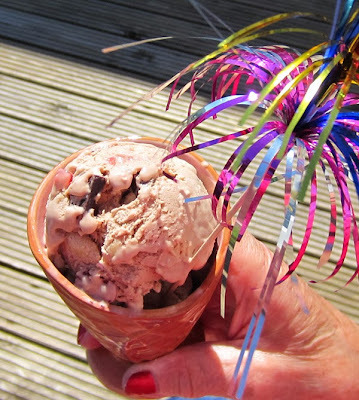 Perhaps because it's chocolatey or perhaps because it's chunky or perhaps because it's chewy, I don't know exactly what makes it so special and popular but it's a great fun ice cream for adults and children alike. Homemade rocky road ice cream ready to eat! I think rocky road ice cream one of the best homemade flavors you could choose for parties and family get-togethers; also makes a great choice for Halloween ice cream too. With your shopping done and your ice cream maker at the ready you'll need to know how to make your rocky road ice cream. Just click here to view full step-by-step instructions and photos. Enjoy! Sloe sloe quick quick sloe!